If you're sick and tired of your beard being a wiry, bushy mess, you aren't alone! According to a recent poll, over 89% of men with beards say that they don't dig the bushman look. And get this...over 72% of women claim they find unkempt beards to be unattractive and dirty. Say what?! Guys, it's time for a change! From Scruff to Buff in 30 seconds! Our Beard Straightening Comb is an innovative men's beard brush that is HEATED! It's the first of its kind. Your facial hair will be flawless after using this amazing product. The design is simple and easy to use. You see, we've implemented the technology of negative ions. 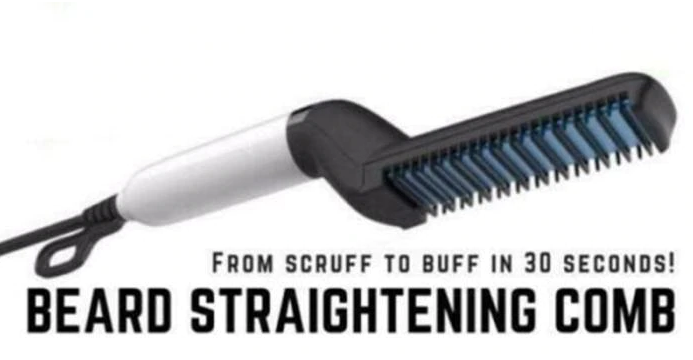 A technology that can tame and control ANY thick and crazy beard. In just 30 seconds, you'll have a soft and smooth beard that looks good enough to run your fingers through. Non-Damaging Design: The implementation of negative ions prevents heat damage from occurring. You can safely comb your beard daily for a sleek, polished look. Innovative Heat Barrier: The bristles of the comb glide effortlessly through your beard hair and scalp without causing damage to the skin. Effortless Style that Lasts: It doesn't matter how unruly your beard is, this comb easily smooths your whiskers and the style lasts and lasts. Multi-Functional: After you've tamed your beard, go ahead and use the comb on your hair, too! Quick-Heating Mechanism: Comb heats up in a New York Minute! 15 seconds, baby! 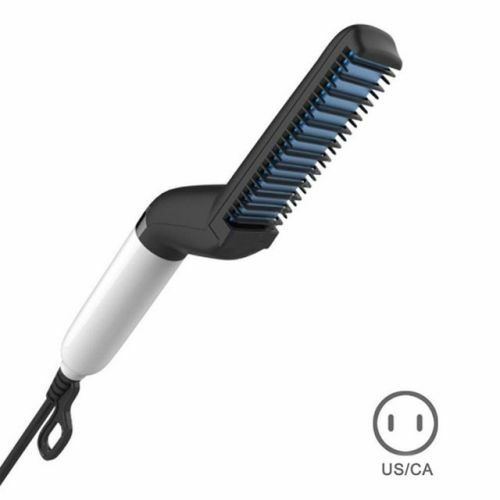 Lightweight & Ergonomic: Very comfortable to hold and easy to control during combing. Make sure both hair and beard are completely dry before using. Simply plug the device in and turn the beard straightener on. Brush through the hair and beard, going from roots to tips until the desired look is achieved. Multiple passes through the same strands will not damage the hair. When finished, switch the beard straightener off and unplug it, waiting for it cool down before storing.